BLACKSBURG, VIRGINIA – The Islamic Republic of Iran marks its 40th anniversary this week. But, with the country beset by a severe economic crisis, the question on everyone’s lips –within Iran and the diaspora alike – seems to be whether the Islamic Revolution has actually improved Iranians’ lives. Since last May, when the United States withdrew from the 2015 Joint Comprehensive Plan of Action – better known as the Iran nuclear deal – and re-imposed its toughest sanctions on Iran, the Iranian economy has taken a nosedive. The currency has lost 70% of its value, and prices are rising at a 40% annual rate, placing new strain on an already underperforming economy, in which one-third of university-educated young people are out of work. But a closer look at the data on Iran’s economy does not support the view that the Iranian public has been driven into abject poverty since 1979, let alone that it is on the brink of revolting. True, many older Iranians have fond memories of the decade before the Revolution, when the country experienced robust growth that tripled per capita GDP. Yet Iran also performed well after the Revolution. 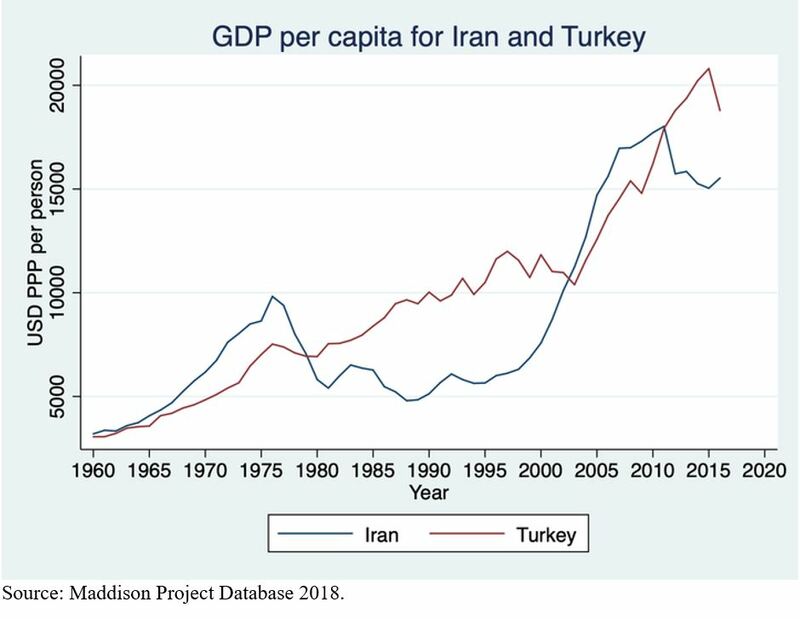 In 1995-2011 – before Trump’s predecessor, Barack Obama, imposed growth-stifling sanctions – Iran achieved per capita GDP growth (in purchasing power parity terms) of 8.7%, on average, compared to just 2.9% in neighboring Turkey. Indicators of individual welfare show similar improvements. Based on the combination of per capita income, educational attainment, and life expectancy, the 2018 Human Development Report ranked Iran 60th out of 189 countries, ahead of Turkey (64), Mexico (74), and Brazil (79). Moreover, survey datahave shown consistent improvements in Iranians’ access to basic services and household amenities. Today, all households in Iran have access to electricity and clean water, up from 43% and 33%, respectively, in 1973. Cheap natural gas – non-existent before the Revolution – is now piped into 85% of all homes. The comparison is even more favorable when one considers that Iran’s oil wealth – which underpinned living standards in the 1970s – has been shrinking. Thanks to historically high prices in the five years before the Revolution (1974-1979), Iran’s oil revenues amounted to an unprecedented $1.03 trillion (valued in 2018 dollars), or about $5,000 per person per year. The most lucrative five-year period after the Revolution – 2007-2011 – brought just $0.6 trillion in oil revenues, or $1,365 per person per year (which also reflects the more than twofold increase in population since 1979). Despite this decline, the Islamic Republic has gone a long way toward fulfilling some of its key promises, such as reducing poverty. In the 1970s, urban households received a far larger share of the oil bounty than disadvantaged rural households. For example, in 1973-1975, the share of urban households with access to piped water rose from 65.4% to 79.7%, whereas in rural areas it increased from a mere 7.6% to 8.5%. Since the Revolution, however, Iran’s leaders have pursued investments in infrastructure that have expanded access not just to piped water, but also to health and education, for rural areas. As a result, poverty has been reduced substantially, from over 20% in the early 1970s to less than 10% in 2014. Yet, as with most revolutionary regimes, the Islamic Republic’s successes have stemmed more from direct government policies, such as the delivery of basic services and cash to the poor, than from those that depend on market incentives. This accounts for the lack of sufficient jobs: unemployment among university-educated youth, which was non-existent in the 1970s, has surged to 30% for men and 50% for women. Moreover, while post-Revolution Iran has improved equity in some areas, it has been less effective in reducing income inequality. The Gini coefficient (a common measure of income inequality, with zero representing maximum equality) has remained above 0.40, not much lower than it was in the early 1970s. Of course, when it comes to quality of life, economic indicators do not tell the whole story. And, while living standards for average Iranians are in many ways measurably better under the Islamic Republic than they were under the Shah, that does not make up for high unemployment, let alone the social restrictions that have been imposed since 1979. Still, the Trump administration’s goal of regime change from within seems a distant one. Djavad Salehi-Isfahani is Professor of Economics at Virginia Tech, Senior Fellow for Global Economy and Development at the Brookings Institution, and a research fellow at the Economic Research Forum (ERF) in Cairo. Djavad Salehi-Isfahani says Trump’s withdrawal from the nuclear deal with Iran and the re-imposition of sanctions lifted in 2015 aim at regime change. The administration and its allies – Isreal and Saudi Arabia – hope that widespread dissatisfaction could accelerate an implosion in Iran, when ordinary people would rise up and overthrow the Islamic Republic. Yet the 2017–2018 anti-government protests across Iran fuelled by hyperinflation and unemployment did not spiral out of control. The author says “the economic data do not support the view that the Iranian public has been driven into abject poverty since 1979, let alone that it is on the brink of revolting.” The first decade was tough, especially when an acute economic crisis – the price of Iranian oil fell to close to $11 a barrel – combined with the burdens of the war with Iraq, diverted the regime from its goals of economic development and compassion for the poor. Iran’s economy is based on a single asset, oil, turning the country into a classic example of a rentier economy, whose negative impacts are many. Due to the relatively easy and ongoing income from oil, the government has no impetus to develop other business sectors or diversify the economy, even if sanctions were not in place. Without a diversified economy, a business sector does not develop and opportunities for young people, especially graduates, become limited. Rampant corruption is a way of life in Iran, with abundant opportunities for an authoritarian regime to develop as power becomes closely tied to a single resource. The citizenry are kept in subjugation, living on government handouts. Human capital is wasted as advanced technological jobs are not created. Eventually, a dramatic wealth gap develops, separating the privileged, that are close to the regime, from the tens of millions, who live below the poverty line. The country is plagued by stagnating production, high unemployment and lack of capacity. Youth unemployment is especially high, as one-third of the entire population is between the ages of 15 and 29. The nuclear deal with world powers undermined the dominance of hardliners, who made fortunes off smuggling and their control of state industries. The Revolutionary Guards are the biggest player in Iran’s main industries: energy, construction, car manufacturing and telecommunications. Despite widespread grievances, last year’s protests remained fragmented, localised and uncoordinated. Iranians do not support Trump’s call for “regime change.” He believed Iran was just months away from collapse and stepped up pressure on the country, hoping it would implode. He could not be more wrong. Not only is the regime far from demise, His narrow focus is counter-productive and goes against what most Iranians really want – prosperity and stability. There is a difference between today’s Iran and the one that emerged 40 years ago. Thanks to isolation the country learns to adapt and mature. It has become more pragmatic and less keen on spreading the revolution and its ideology. The government’s reaction to the wave of protests last year was a recognition that blaming outside powers would not work. The political establishment, led by the supreme leader, legitimised protesters’ demands and promised reform. The reform-minded president, Hassan Rouhani knows that any lasting change for the better can only come from within the country, spearheaded by Iranians. The country has to evolve domestically, trying to keep up with a dynamic and changing society, while improving living standards for average Iranians, who “are in many ways measurably better under the Islamic Republic than they were under the Shah.” However, high unemployment....and the social restrictions that have been imposed since 1979” are a thorn in many young Iranians’ side. They want change, but not Trump’s version of it. It's always good to find a piece like this, which at least seems to present the objective facts about a country the "western" media love to hate. Thanks. The west has had two important moments to avoid the Mullah regime: In 1953 and in 1979. In 1953, non-acting (by the US/CIA) would have helped. Mosaddegh was a democratic politician, however he dared to sell persian oil instead of giving it away for free. The CIA intervention was the major cause of todays "Islamic Republic". In 1979, acting (by France) would have kept Khomeini in France, maybe in jail, out of Iran. It is the west, who is to blame for most of what is happening. Other similar examples are the US Afghanistan policy: From Mujahideens to Taliban to Al Qaida to ISIS, all the way with US taxpayers money, and the Gulf wars: Decapitating Iraq, Libya, almost Syria and then wondering about the effects. All-in-all: Trump is right by stopping the "treaty" and wrong otherwise. US should for once keep out of all other 192 countries of this planet. It is silly to use these worn out sayings " ..if only we could have done this or that .. Sort of things..." . How about turning the clock back to start with or having 20-20 vision gulping magic pills!